Perhaps because it's lumped together with graduation (you know, the whole "dads and grads" thing), but for some reason Father's Day never gets quite as much love as Mother's Day. 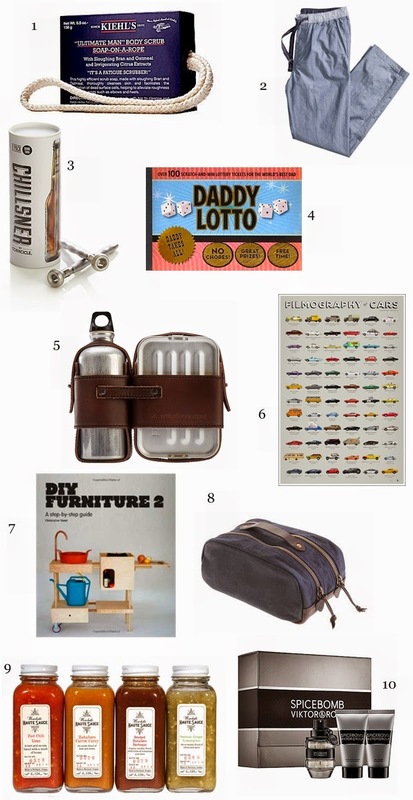 Still, dads deserve a great gift too, so whether he's your dad or your husband, your brother or your boyfriend, let the father in your life know he means the world to you with a cool gift made especially for him. 1. He's probably not thinking about how rough his elbows and feet are, so help him out with this body scrub. 2. Every man should own a nice pair of pajama pants. 3. Because sometimes a cold beer is essential to his happiness. 4. A major hookup that includes get-out-of-chores-free tickets and more. 5. A hard-working papa deserves an extra special lunch box. 6. All the coolest cars from film and television (including a time-traveling DeLorean) on one poster. 7. For the DIY guy in your life. 8. Whether he knows it or not, every man needs a good toiletry/travel bag. 9. For the gourmand father: grilling sauces, marinades, rubs, and even a bacon-infused mayo. 10.Spicy and slightly sweet, every man should smell this good.